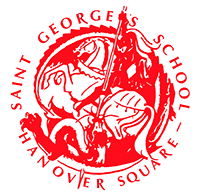 Welcome to St George's Hanover Square Primary School. At St George's we aim to make your child's early education an exciting and stimulating time. St. George's is a Christian school which works in partnership with parents, governors, the church and the local community. Through friendliness and care we develop independent, successful and confident learners. In reverence we embrace the awe and wonder of God's creation. In service we celebrate the diversity and uniqueness of each other.